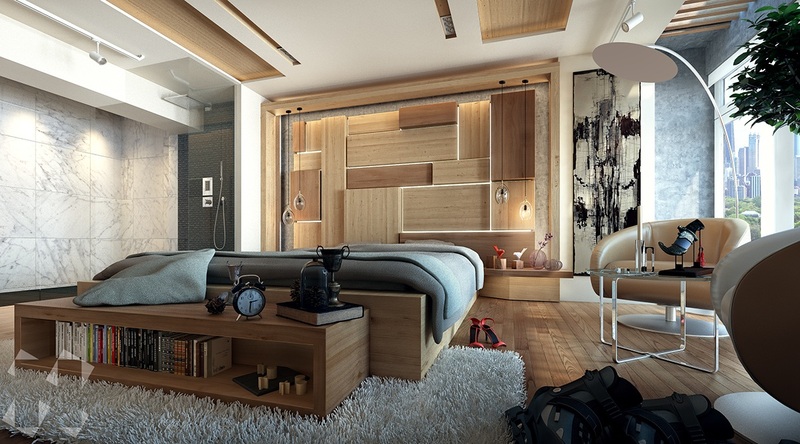 Bedrooms are the perfect place to experiment with a new interior design style. 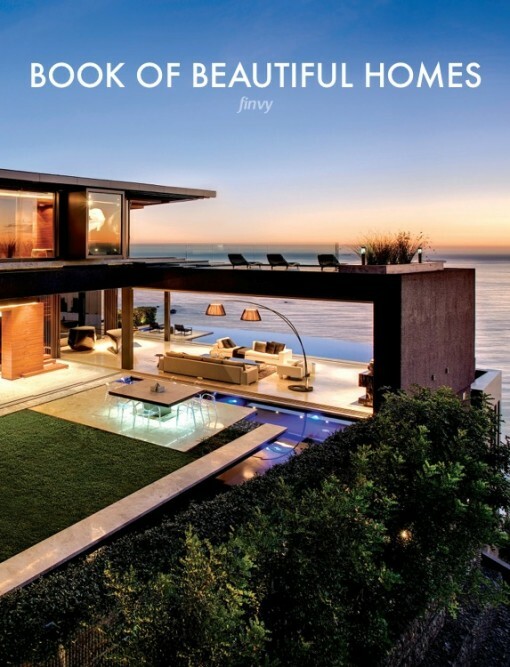 They tend to be private and set away from the rest of the home, a wonderful catalyst of personal expression. 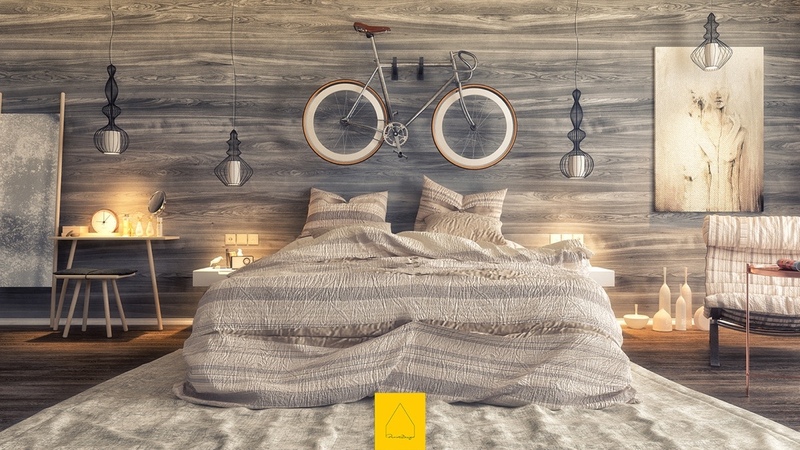 Today's top bedroom trends are bolder and more adventurous than ever so there's never been a better time to explore the possibilities. 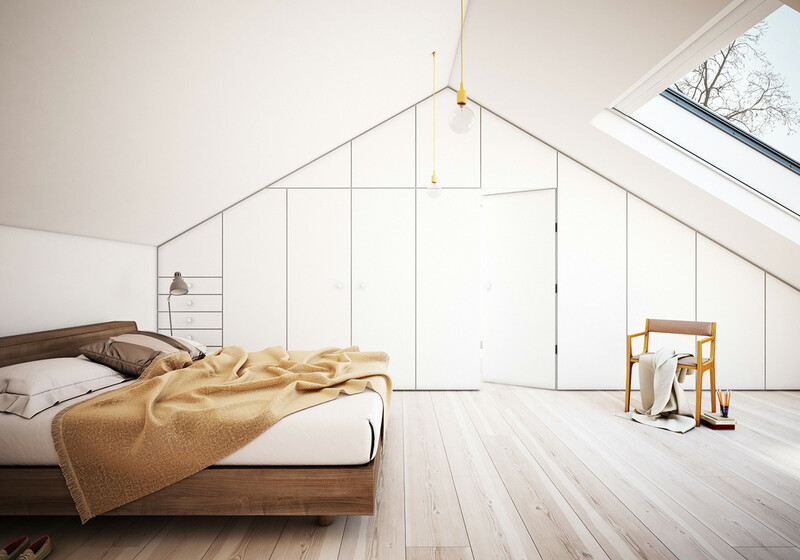 This post looks at seven attractive bedrooms in detail, ranging from classic to contemporary to minimalistic and eclectic. 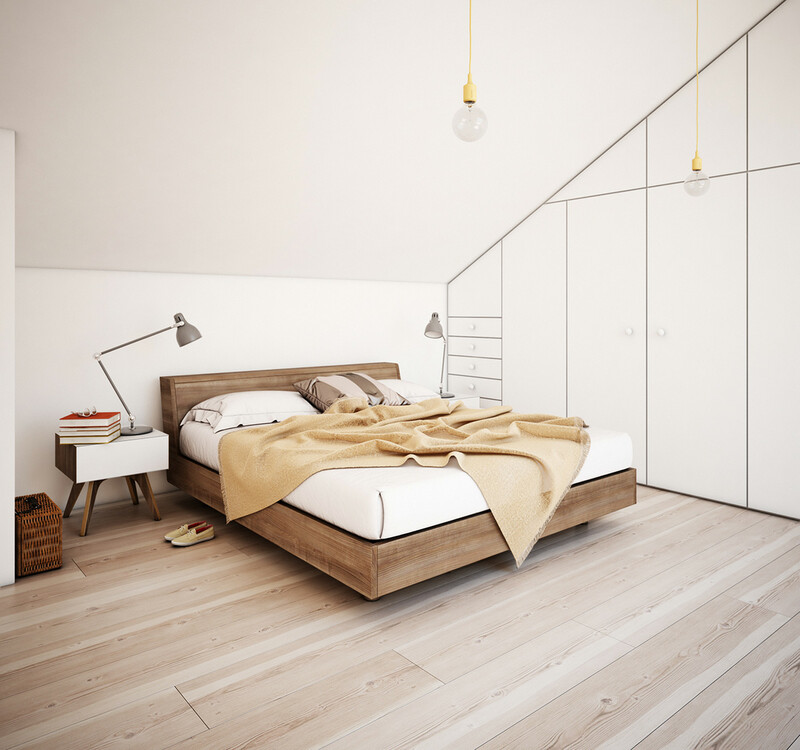 A few of these bedroom styles would be easy to recreate while others exemplify the highest standard of precision design – yet each one offers useful inspiration. 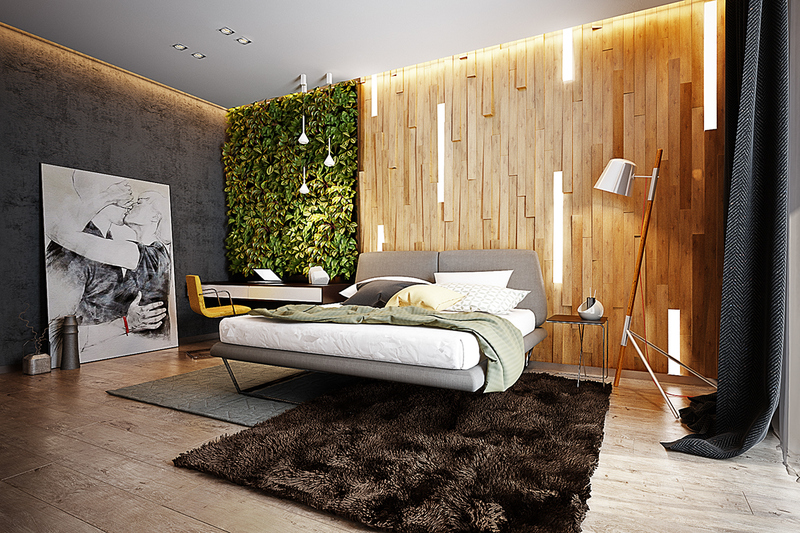 This first bedroom utilizes an ecological theme contrasted with perfectly contemporary styling. 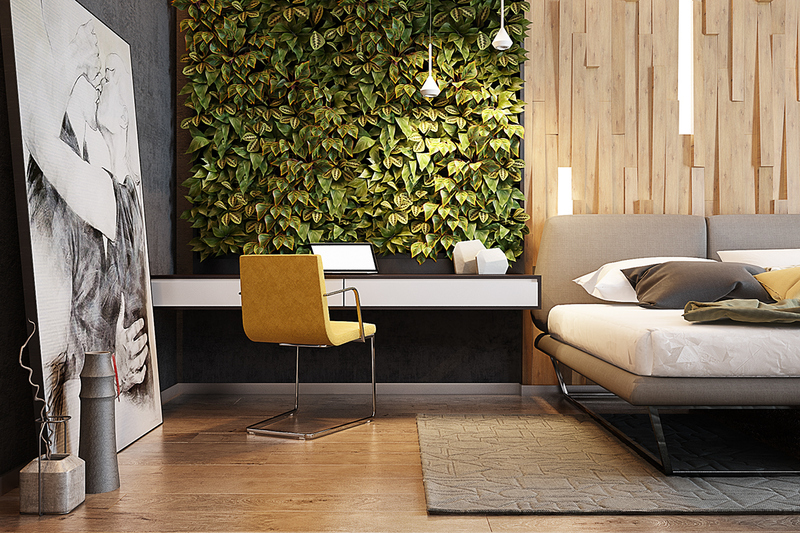 A lush vertical garden and angled wood panels create an atmosphere few would be soon to forget – and while these features might be the most difficult to emulate, they’re certainly not impossible to adapt. 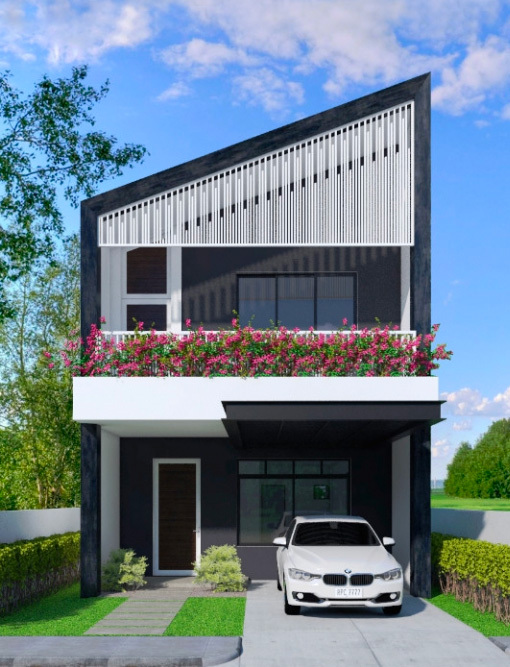 The dichotomy between organic materials and refined forms is even more apparent from this angle with the smooth white paneling, knotty wooden door, and distressed matte black wall. 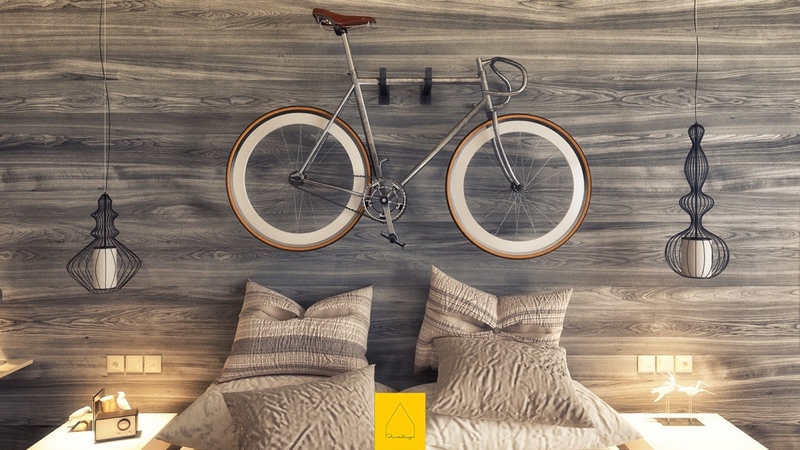 Every surface reveals an unparalleled attention to detail. 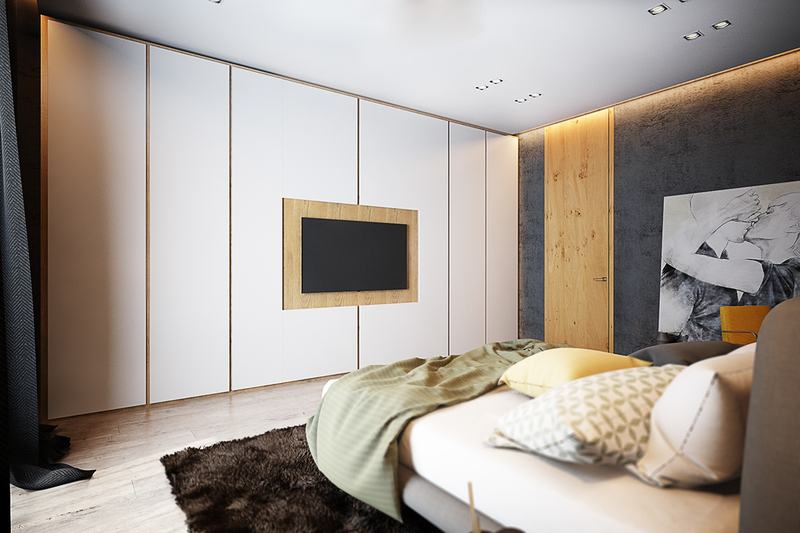 Note the layered paneling on the entertainment wall and how it seamlessly conceals the extra storage space hidden inside. 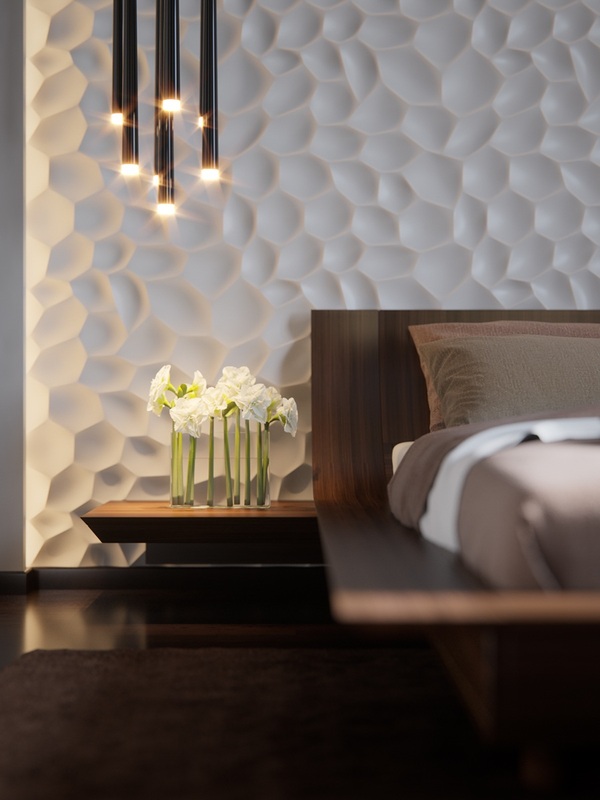 Backlit panels bring out the deep grooves of the accent wall – gorgeous even in the daytime. 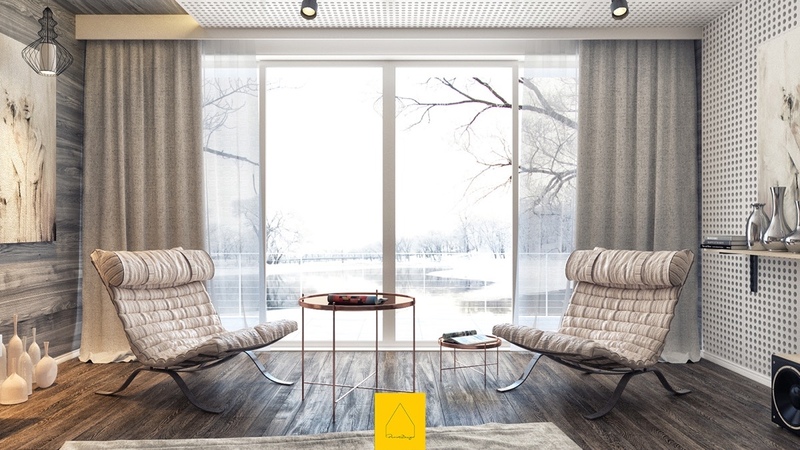 This geometric rug ties the space together nicely, and the chair offers the perfect splash of cheerful yellow. 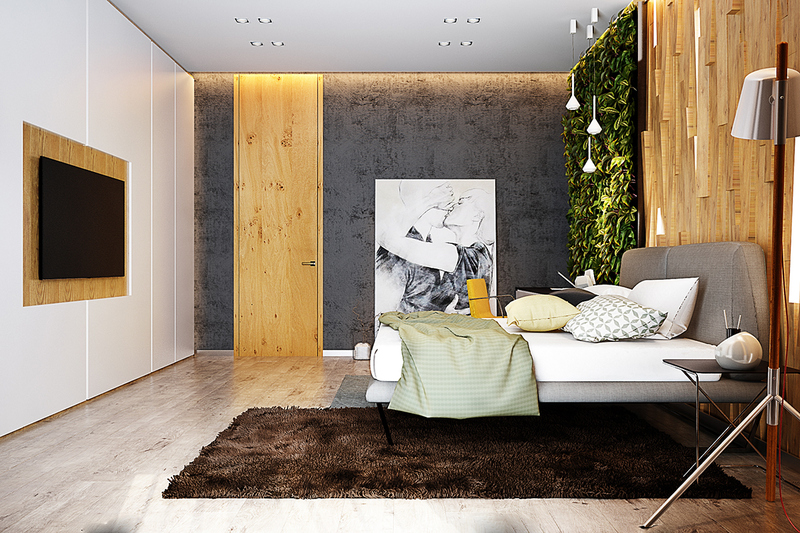 This is a proposed design for a sophisticated apartment in Bucharest, its amazing urban view framed by a relaxing natural interior with lots of varied wood tones. Smooth round forms mingle with the primarily straight lines and precise angles for a very balanced aesthetic overall. Unique features include the open marble-walled bath area to the left, and the concrete-framed windows to the right. 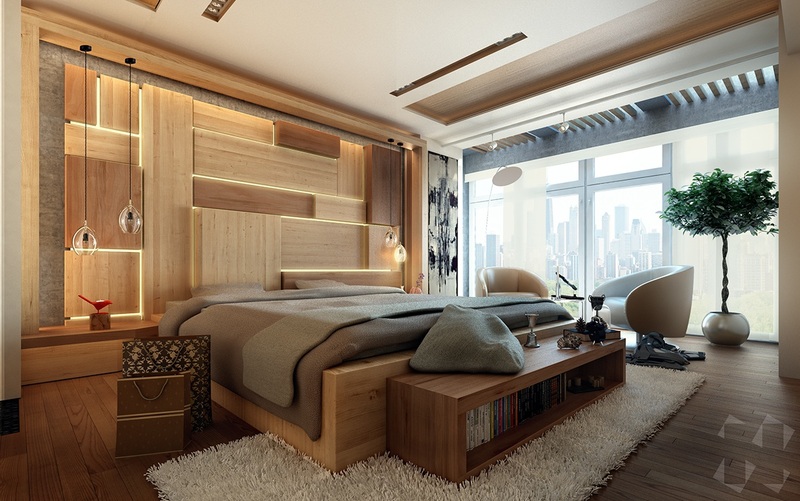 The centerpiece is a headboard wall composed of backlit wood panels, a fresh take on the strategy employed by the first bedroom. 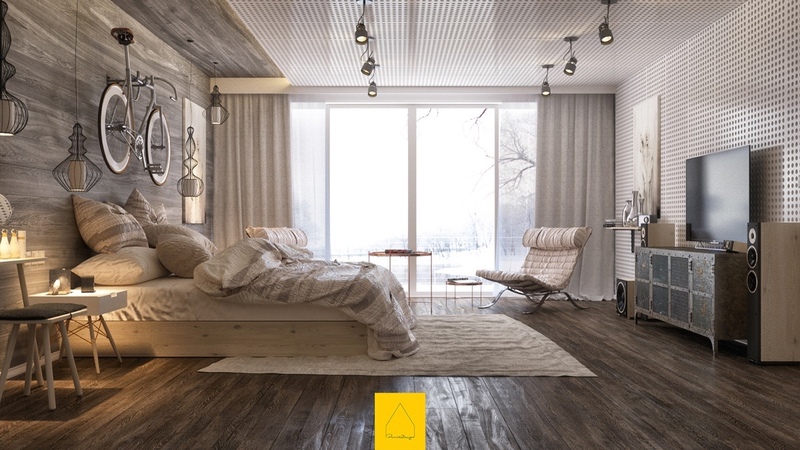 Here’s an updated take on the chic cottage style decorated in soft gray with lavishly layered textures, the cool tones illuminated by yellow light for a warm and inviting atmosphere. 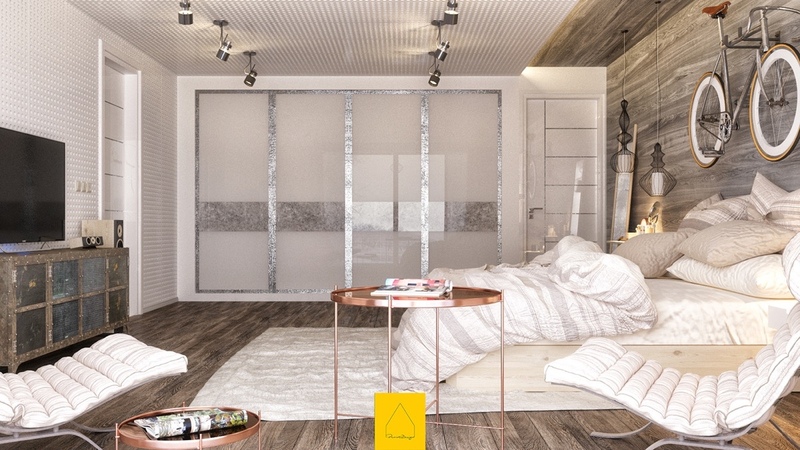 The horizontal wood paneling in the background creates an undeniably luxurious feeling despite the humble textiles and uncomplicated decoration. 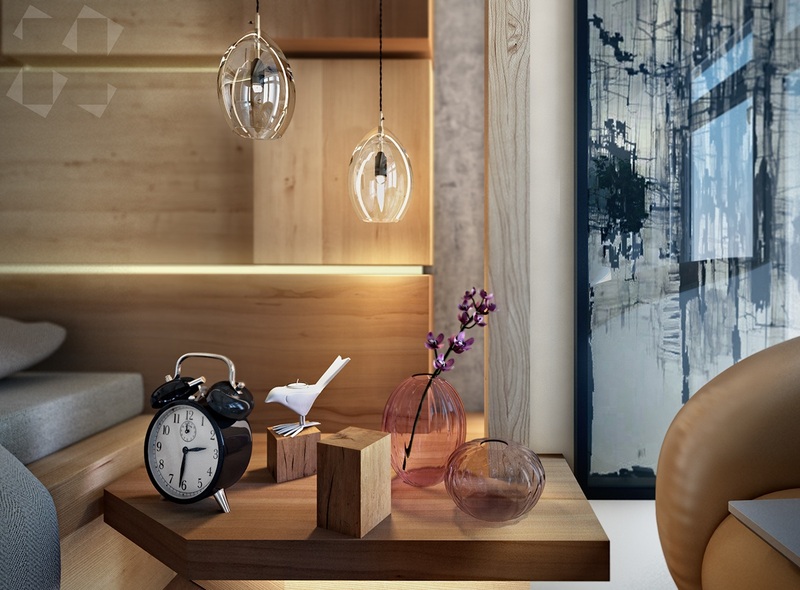 Simple wooden furniture and cool vintage-inspired lamps offer a subtle mix of Asian and Scandinavian design influence. The opposite wall drops the vintage facade and reveals an ultramodern wall treatment, glossy white with a perforated effect. An occasional pop of orange and a handful of copper furniture adds just the right amount of color. 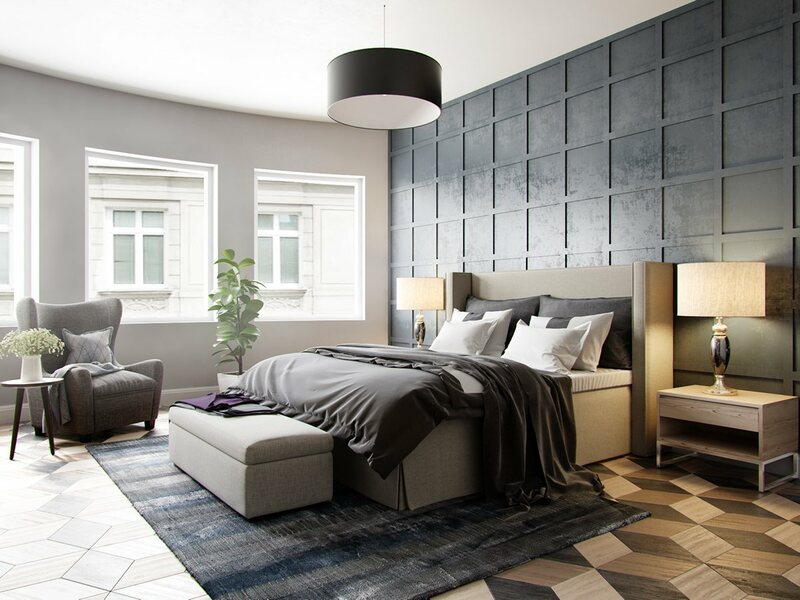 Interesting materials allow the far wall to express a very distinctive style, falling somewhere between minimalist modern and a streamlined interpretation of art deco. It’s hard to find a color palette more comforting than a dark and smooth grayscale theme like this one. 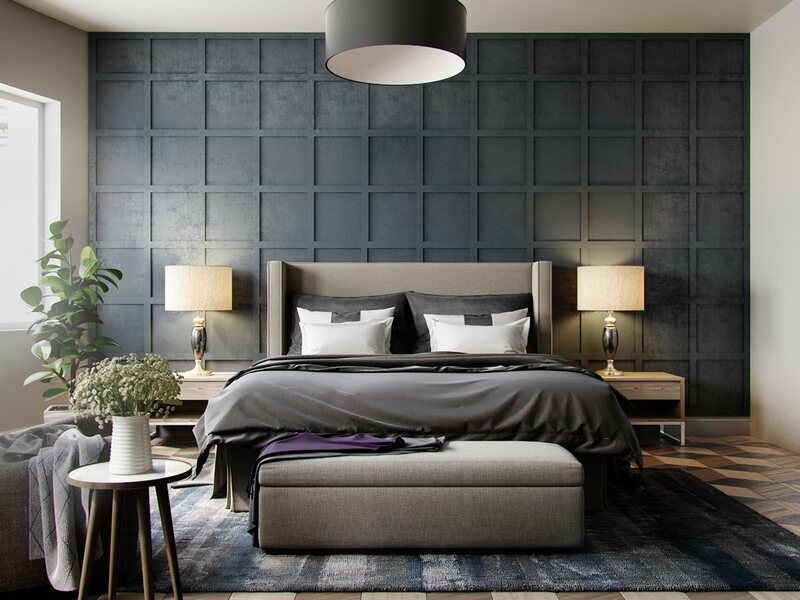 While darker colors are harder to incorporate into the more public areas of a home, they’re perfectly suited to a private and intimate space like the bedroom. 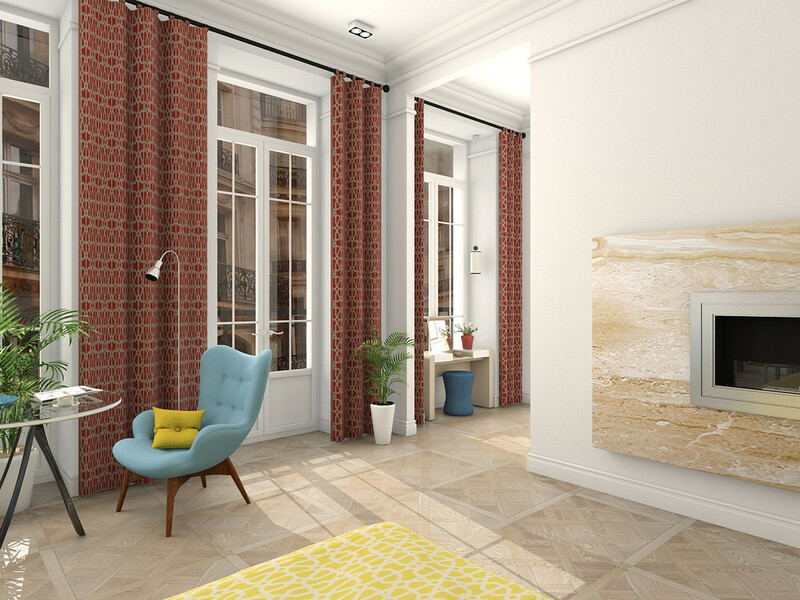 A dramatic curved window bay and classically styled furniture create an interesting juxtaposition against the ultra-modern features like the geometric floor design and contemporary wall paneling. 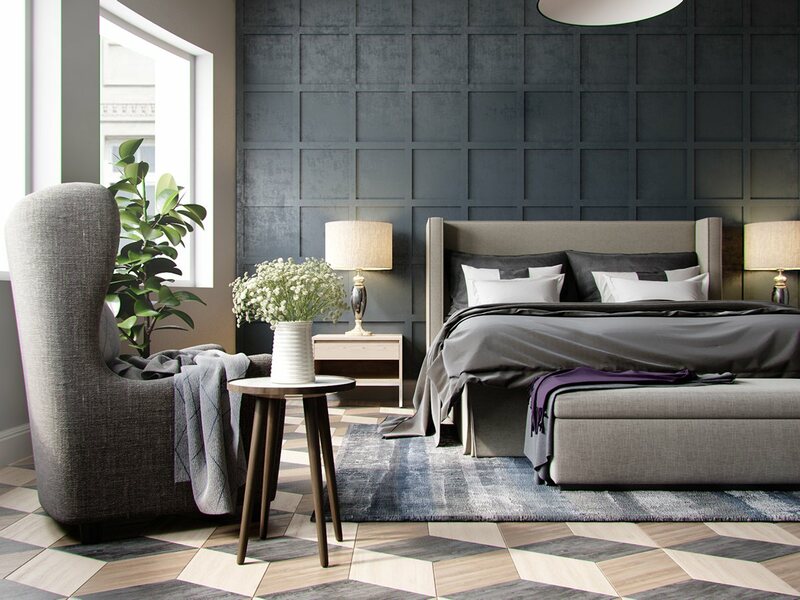 Subtle blue stripes in the rug bring out the coolness of the gray tones used throughout. A very soothing theme overall! 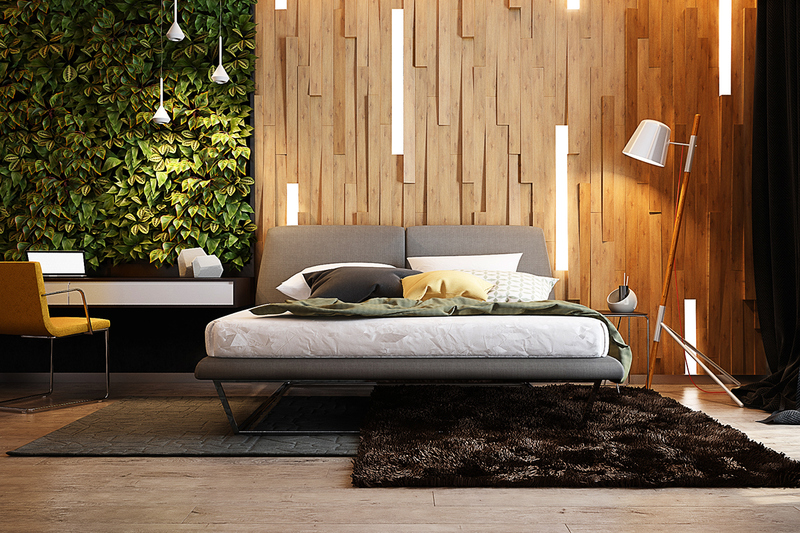 Textured wall treatments require some investment of both time and money, but the results are incomparable. 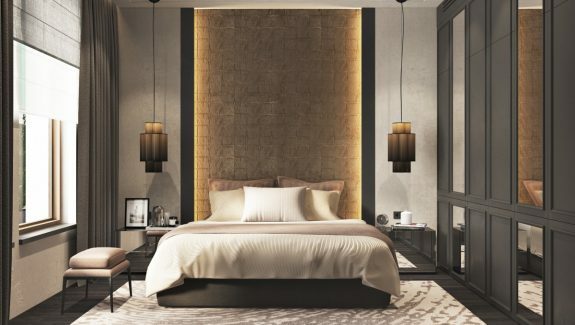 This bedroom is centered an incredibly intricate headboard wall illuminated by cove lighting on all sides for a fabulous drama of lighting and shadow. 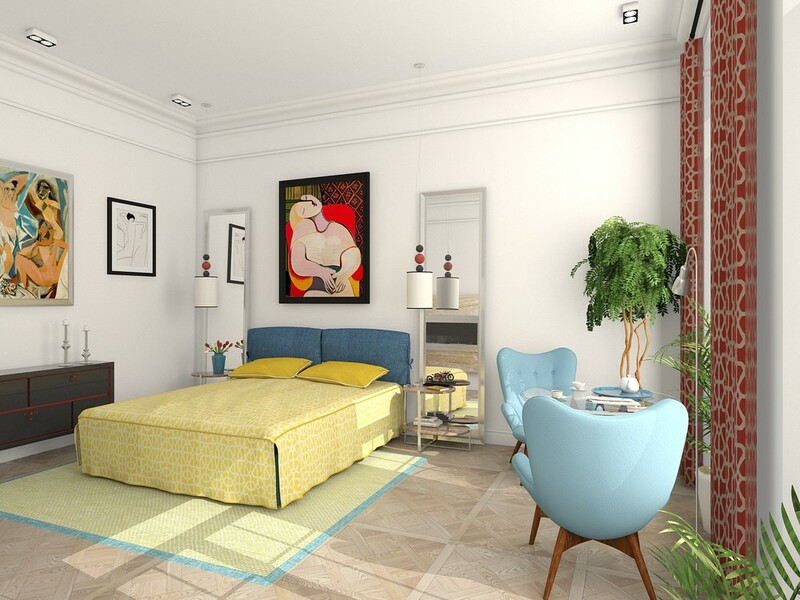 The rest of the space remains simple and streamlined so the main focal point can enjoy the attention it deserves. Here, you can easily see the effect of ambient lighting on the deep valleys and ridges of the wall panel. 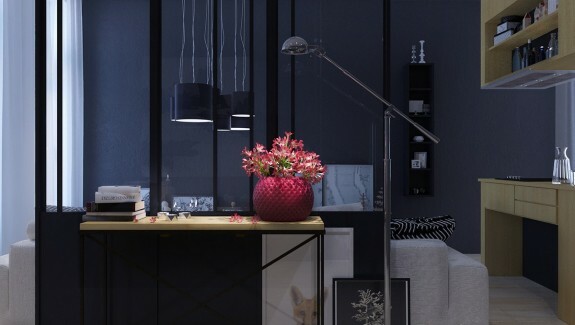 The warm lighting pairs well with mauve interior accents, although the mauve would be easy to change since the surrounding palette leans toward the neutral and natural side. 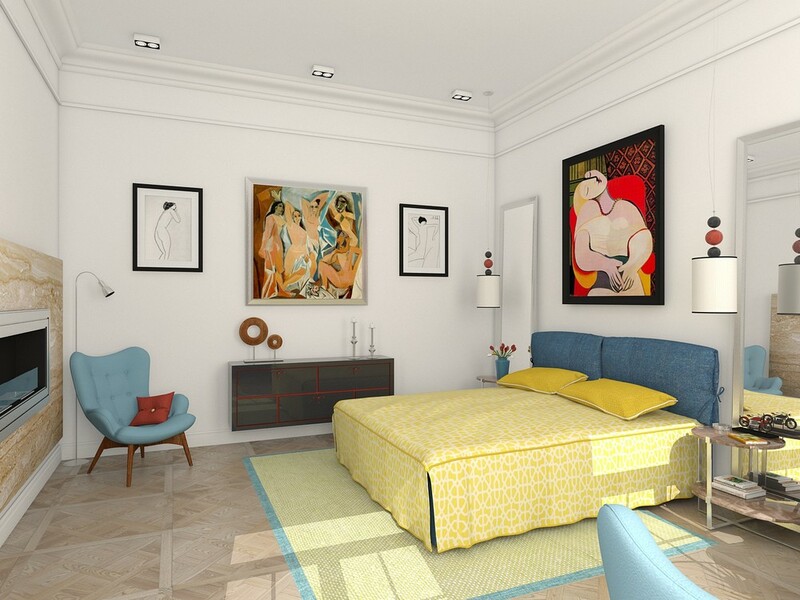 This bedroom suits a very eclectic and classical taste, designed for a young couple that collects art. 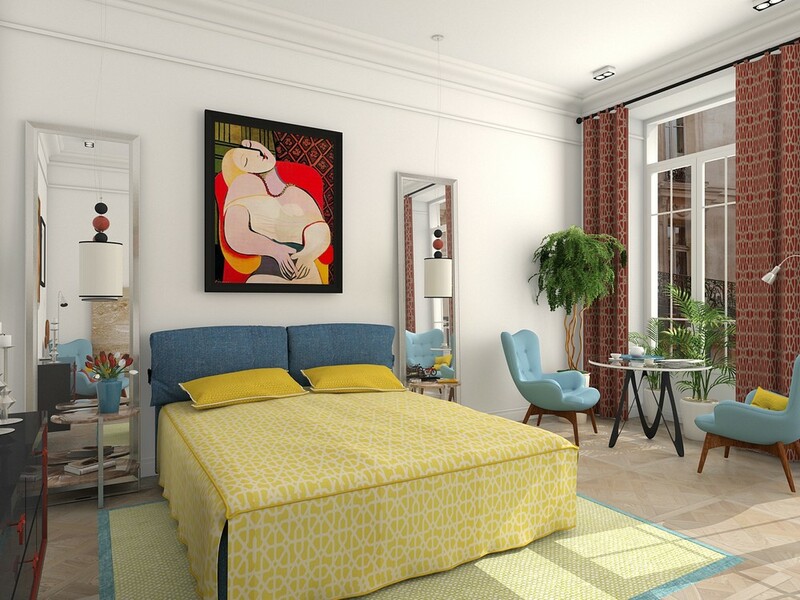 Incorporating artwork is a little easier with a grayscale or neutral color theme but these residents took their chances with bright hues that reflect the tones favored by their artist of choice: in this case, Picasso. Picasso reproductions featured here include Les Demoiselles d’Avignon (1907) and The Dream (1932). Even the shapes of the furniture seem to reflect the gorgeous curves so famously captured in the paintings. One of the neatest features is the lovely little tea table for discussing the day ahead. The chairs are from the Contour series by Grant Featherston, shown here in cheerful robin’s egg blue. 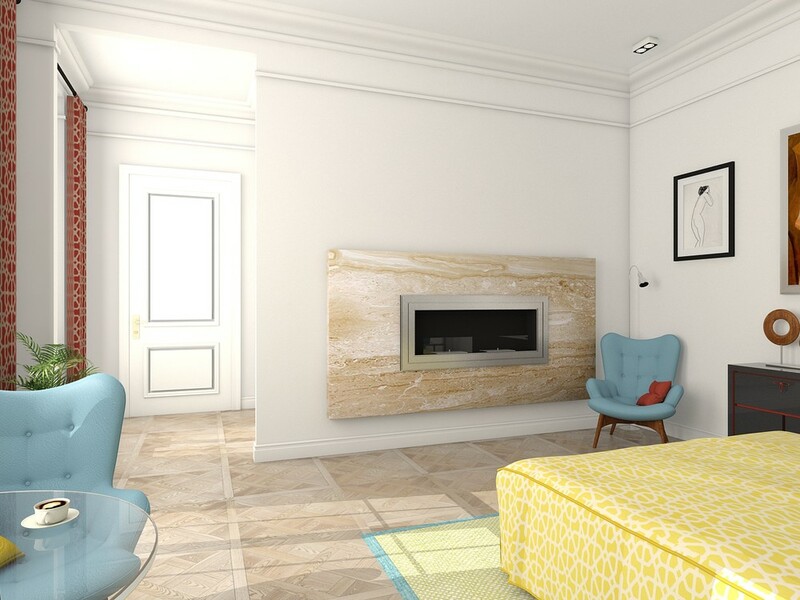 A thin partition wall houses a dramatic stone fireplace mantle. 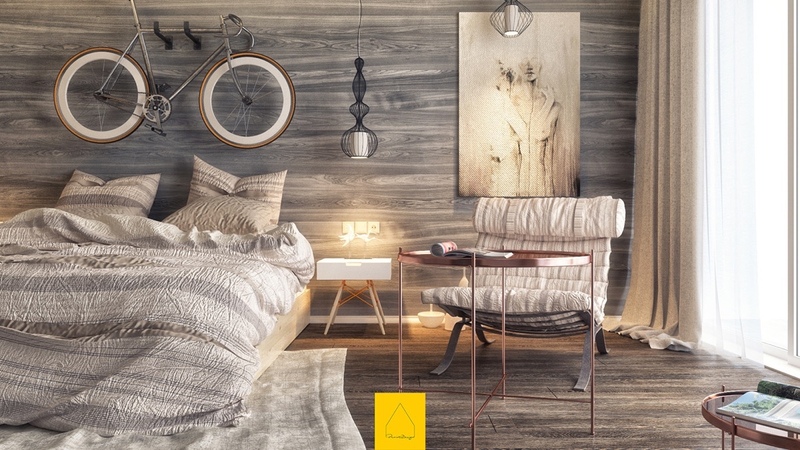 It gives off a classic and artistic vibe well in line with the rest of the room. 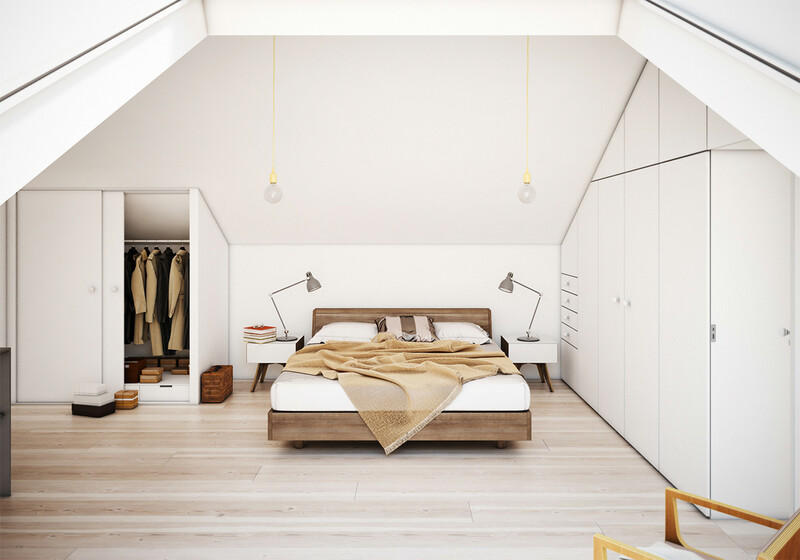 Our final bedroom is spacious, light, and airy, enhanced by its tall gable ceiling and expansive skylight window. The stark white theme is especially striking because of the functional storage wall in the background – the black shadowy lines seem almost like a contour drawing just waiting for the imagination to draw in the details. 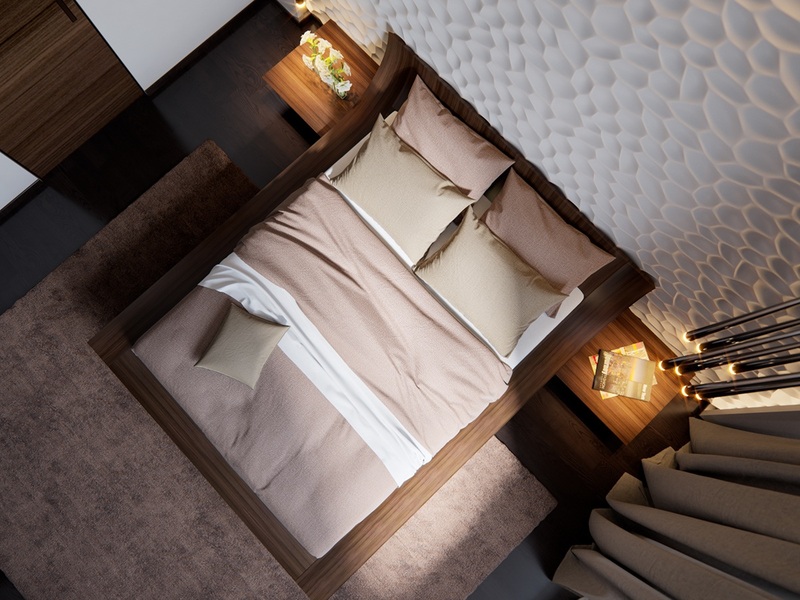 The bed makes a distinctively warm impression with its smooth wooden frame and mocha textiles. 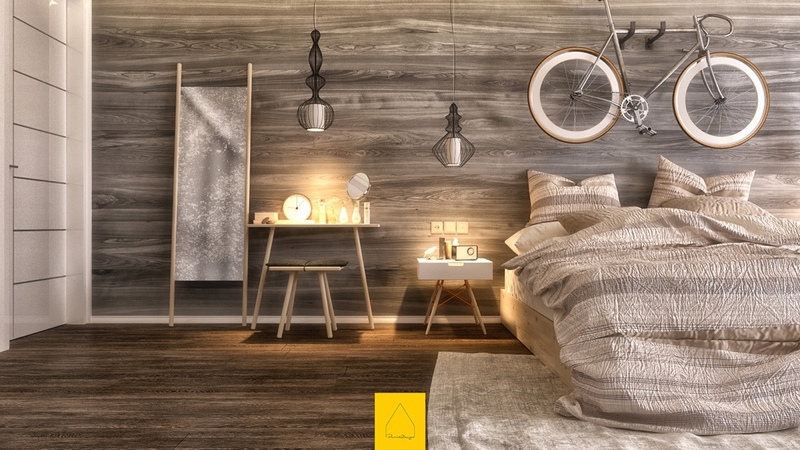 The yellow pendant lights hanging above are from the E27 collection by Mattias Ståhlbom. 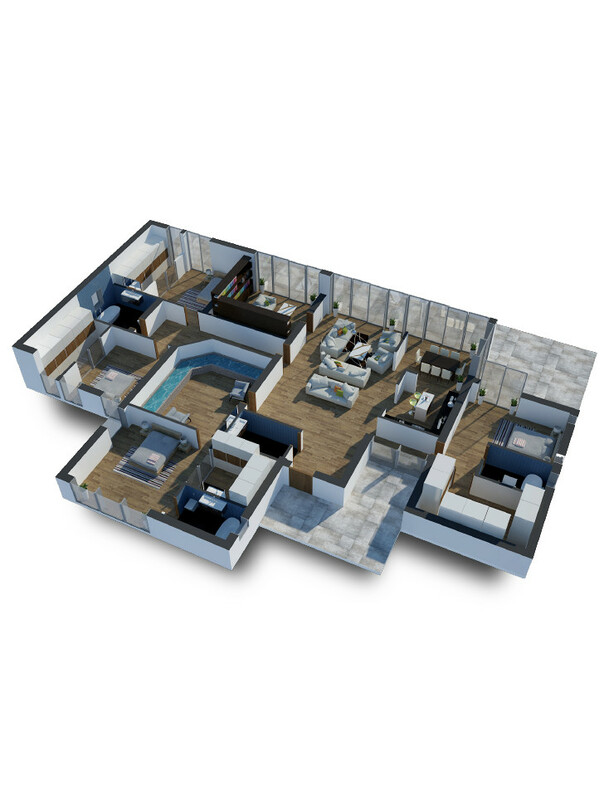 Because the room has such a large amount of extra storage cabinets, the resident can get by with a sparse amount of furnishings. 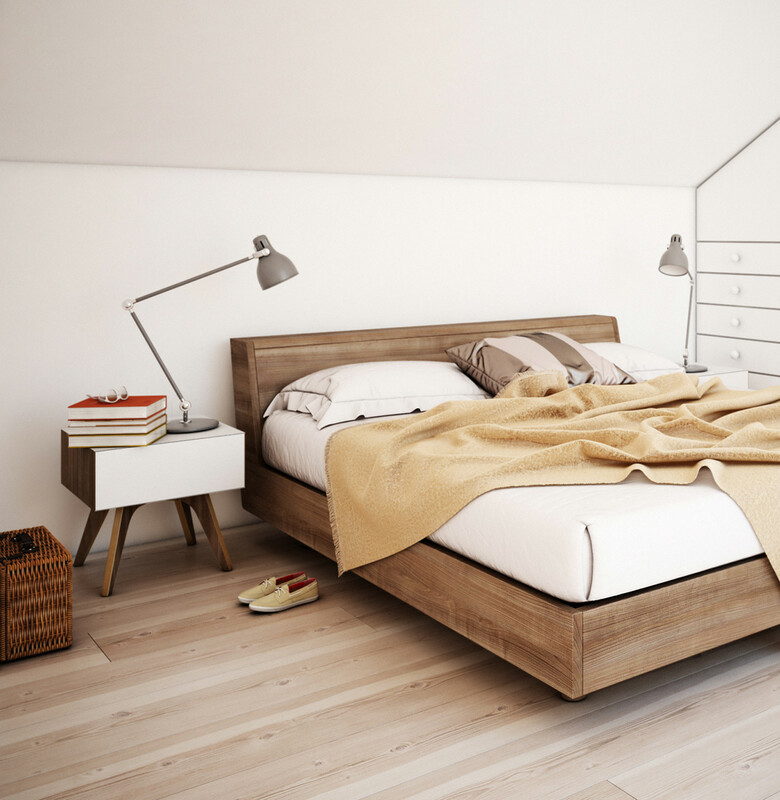 This room pares its furnishings down to a simple set of bedside tables with convenient adjustable task lighting.